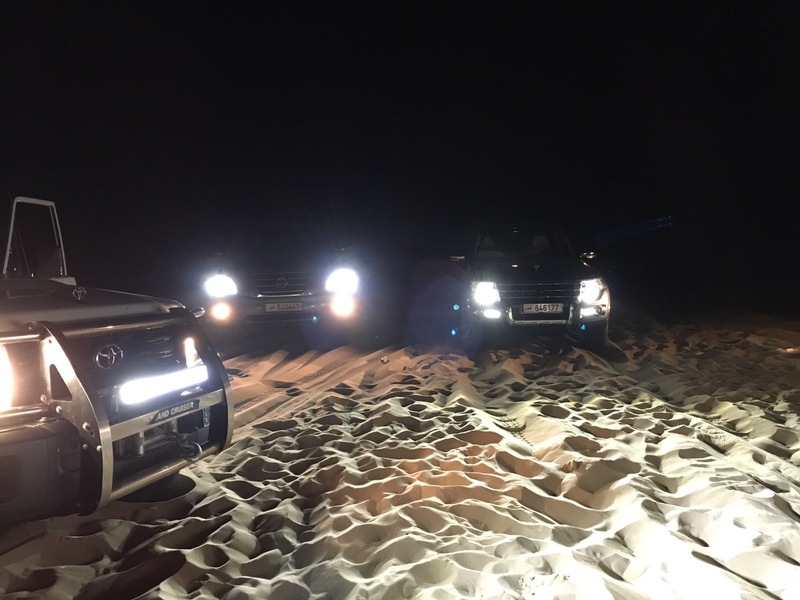 Confident with their 4 x 4 cars and driving skills, my husband and his friend organized a sunset desert drive and an overnight at the Qatar Inland Sea on the last weekend prior to Ramadan last year. At one minute before 6 PM, we deflated the tires when we reached the foot of the desert in Mesaieed, fixed the GoPro camera to record the adventure and set off for a desert drive to the Inland sea. It was an easy but bumpy ride at first until we reached a steep slope after around 45 minutes of driving into the desert. We found ourselves stuck at the foot of a steep sand dune, lagging behind our friend who was nowhere in sight. We were not expecting very steep slopes, as we did not intend to reach the Inland Sea by dune bashing. Minutes later, a group of guys stopped by our car and asked us to deflate our car tires further. Minutes after the guys left, we were still stuck in the same spot. An Arab approached us, checked our tires and helped us to deflate our car tires further. He taught us how to successfully get past the steep sand dune, and so we did. Then we got past a car – our friend’s! He was stuck due to what seems like a more serious problem in his car. Then desert car experts came after another, and we felt so overwhelmed with the number of cars arriving with Qatari men ready to help. There were probably more than 10 cars who came to assist us, excluding the “desert patrol” complete with roving lights. After several tries to fix the problem, our friend’s car was “diagnosed” to be unfit for the desert; thus, they helped tow our friend’s car to the mouth of the desert (where we deflated our cars) and offered our friend some tea. Another car drove with us to the Inland Sea to drop our friends, our food and our things from the other car. We stayed overnight by the Inland Sea of Khor Al Adaid – a UNESCO world heritage site. We capped off the night with picnic food, playing cards, fishing, and lots of stories. It was surprisingly a cold night in the month of June. I woke up at 4:20 AM to catch the sunrise by the beach. It was a surreal moment – the desert surrounding the sea, the relaxing sound of the ocean waves, sand on my feet, and the sun slowly rising to show its power. Before 6 AM, we started preparing to leave the Inland Sea with uncertainty on how three of our friends will come back to Doha; they will not fit into our car. We headed off to the town proper and were at McDonald’s Mesaieed around 7 AM for breakfast. Did our three friends manage to come back from the Inland Sea? I know it is late to be posting this blog after one year. However, in the spirit of Ramadan, and the ongoing crisis in this country, I write to thank our Qatari desert masters out there for your hospitality. It was an adventure to remember. Shukran lak! 🙂 You surely made us feel that we are Qatar! You really got the gift as travel blogger. Wonderfully-written. Keep it up!